Older guidebooks speak of Low Gap Trail as one trail, with a Tennessee side and a North Carolina side. Low Gap Trail II provides access to the Appalachian Trail from Cosby Campground. For this reason, it is a fairly popular trail as it makes for a good loop hike to Mt. Cammerer. At the AT, it connects with Low Gap I, which terminates at Walnut Bottom and CS# 37, and it is one of the more idyllic campsites in the park. Low Gap II is also one of the more steeper hikes in the park at 13% grade. The trailhead is at the hiker parking lot just before the check-in shack for the campground. 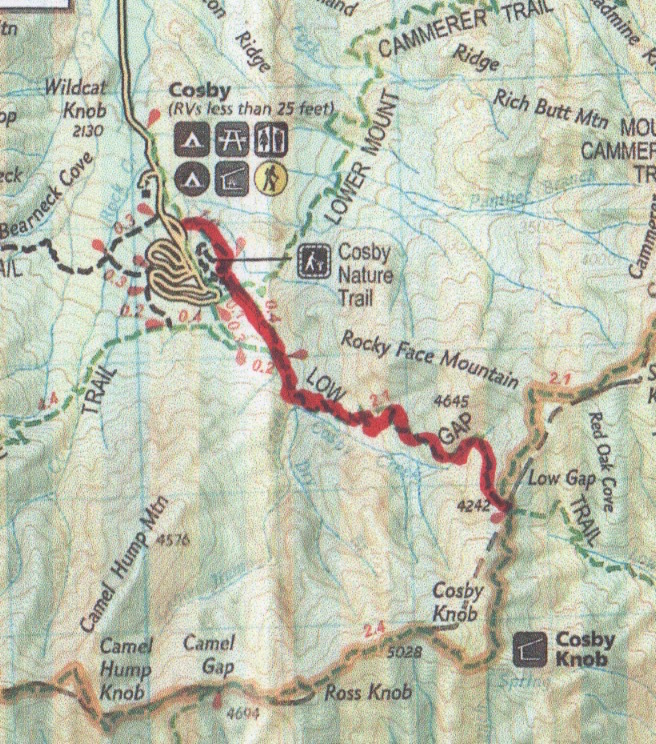 There are a number of trails around Cosby Campground with its several side trails but also, Cosby is the general trailhead for Lower Cammerer and Snake Den Ridge Trails as well. 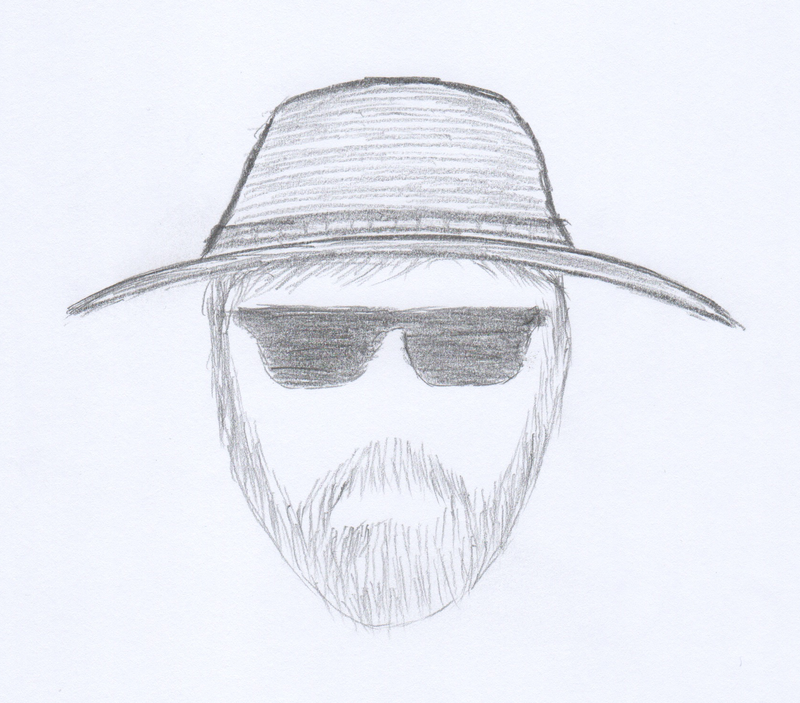 With reasonable attentiveness, the hiker should be able to stay on their intended path. The first 0.4 mile or so is consumed with negotiating the maze of side trails. At 0.2 and 0.3 miles there are creek crossings on footlogs. At 0.4 miles is the intersection with Lower Mt. Cammerer Trail. This intersection is quite confusing because Low Gap II seems to exit to the right. Take care to follow the signs here. The confusion continues at 0.9 miles as the Cosby Horse trail enters from the right. Some guidebooks indicate this is an alternate Low Gap Trail and signs may indicate that. At this point, the climbing begins in earnest and continues the rest of the way up. At 1.2 miles, there is a series of switchbacks in rapid succession before the trail straightens out and continues its steady ascent. The trail crosses Cosby Creek at its headwaters at 2.5 miles and finally,a t 2.9 miles, this step climb is over at the intersection with the Appalachian Trail. Low Gap Trail I heads down the ridge 2.5 miles to Walnut Bottom. To the right on the AT is Cosby Knob Shelter at 0.8 miles and to the left is the Mt. Cammerer Trail at 2.1 miles. 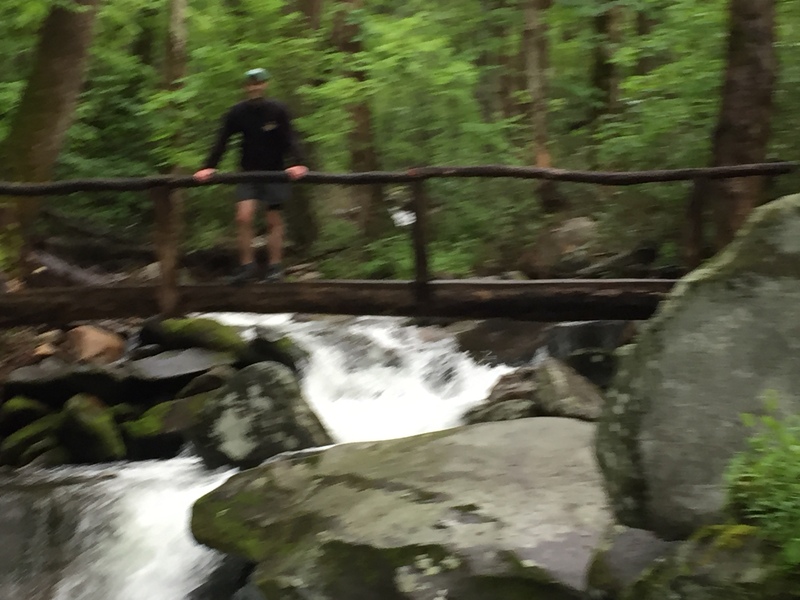 This entry was posted in Trail Log and tagged Appalachian Trail, Cosby Campground, Low Gap Trail on July 13, 2016 by blogginggazelle.